Hello! Hello! Anybody still out there? Probably not after all these months. Still, I've just finished DH's socks and wanted to show them off, mistakes and all. I have a few other things to show off as well, though not the work of my own hands. 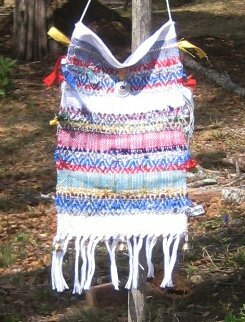 The first, is Rascal's memorial prayer flag, woven by Theresa. Rascal was a much loved and faithful companion, so this flag is very special to me. Thank you Theresa! A name drafted scarf, woven for me by Ellen Turpening. The warp was threaded in our Guild name, Western North Carolina Fiber/Handweavers Guild, for our annual retreat last year. She had some warp leftover, and treadled, "Thank you Leigh Tate for being our president." It was given to me at our November 2010 meeting, when I turned the reins over to our incoming president. I can't tell you how surprised and honored I felt. Thank you Ellen! Three months is a long time in between posts. I'm still on the fringes of my fiber world, so I can't guarantee how much better I'll do in the future. Still, there are seasons in our lives, and this is one love I will always come back to. Socks are great! I bet he won't notice any mistakes unless you tell him they're there. The hat is so cute!!!!! I bet you can't wait to see your new grand baby wearing it. I am so touched with the prayer flag Theresa wove for Rascal!!!!! 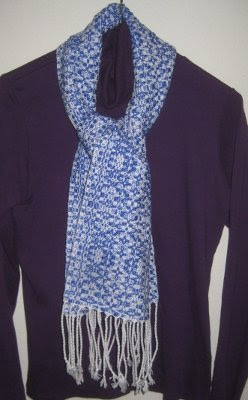 Scarf is so pretty and I'm sure it will look so nice on you!!! Nice to see some fiber work Leigh. What fun to have a baby in your future. Barb and Janet, thank you! It has been a long time since I checked in here. It's odd that I'd do it the day after you make a long awaited post. 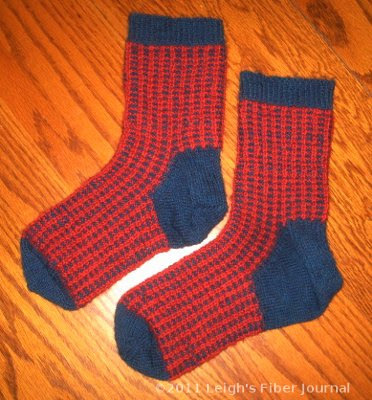 I love the socks, I would like to make my hubby a pair but my knitting skills are not that good. It's exciting waiting for that first grandchild isn't it? My grandson is due any day now. 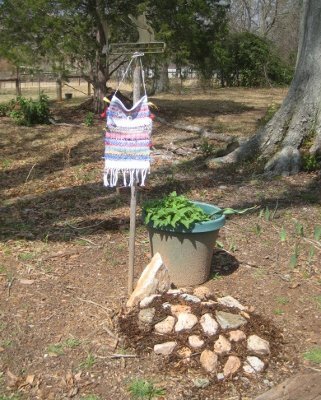 I love the special memorial prayer flag that Theresa wove! And the thank you scarf from your guild, I'm sure you earned it :) Prettiest of all is that little hat, I like the blue stripes, and yellow bits, so it isn't total pink. I'm afraid I've joined your world!! But singing, not a new home, is the cause. Haven't blogged in a few months and am getting ready to remove the ridiculous warp from the loom. I am now planning something much more reasonable--a set of placemsts in 10/2 cotton in a one-shuttle weave. Doesn't sound like me, does it?! I still do want to weave, but only in a relaxing, spare moment kind of way. Dorothy, so good to hear from you! I know you've been super busy. Isn't the prayer flag great? It's a treasure and so is Theresa. Peg, no wonder! Still, there is a season for everything and every interest. :) Quite a weaving switch for you though! Thankfully, Google reader tell me when friends post. Obviously I've not been onto my reader lately since you have so many posts already, but it's lovely to see you in this mode. Glad to see you back. And congrats on the great news that you are about to be grandmother! Congratulations on the grandchild to be! 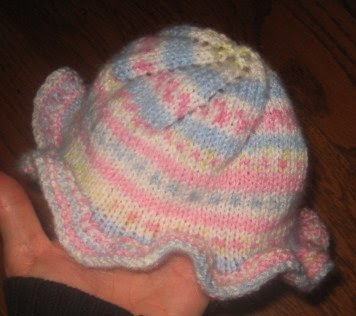 Sweet little hat! Patrick, thanks! Good to hear from you too! 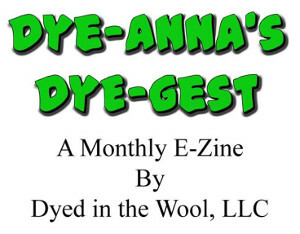 Nice socks - a friend in our spinner guild is making me a pair of socks (to thank me for doing the newsletter I think) but I'll be excited to get them. The prayer flag for Rascal made my eyes leak - I'm trying to come up with something to memorialize Sinda's final resting place that will be acceptable to The Shepherd. I don't want her spot to get forgotten. I always pop into this blog on my way to your Homestead blog - glad to see you've been able to do some fibery things amongst all the work that you've been doing on the house. T.